Content of this article : Bearing capacity of soils,Methods of determining the Bearing Capacity of Soils,Safe Bearing Capacity.factor of safety,safe bearing capacity of different soils. These soils are generally rocky in nature, in compressible and can bear fairly good loads. Solid rock, moo rum and stony soils are examples. These are alluvial soils and are compressible when loaded. They can to take much load. Ordinary clay, loam, and common soils are examples of this. These soils are compressible when they are confined and prevented from spreading. These soils when load­ed spread out laterally. Sand and gravel are examples of this type of soil. Bearing power or Bearing capa­city of a soil is defined as the maximum load that a soil can bear per unit area (usually Tonnes per sq. m) without yielding or causing cracks, displacement or rupture. This is the ultimate capacity of a soil. But as far as designing is concerned, we are less concerned with the ultimate load or the ultimate capacity of soil. Dig a pit of size 2 mx2 m and of the required depth. The bottom of the pit is level led by simply spreading the soil by hand. It should never be compacted. At the centre of this pit put a steel plate of 60 cm X 60 cm X 5 cm. Drive to pegs equidistant from the steel plate as shown in the figure. Over the steel plate erect a wall 40 cm X40 cm either with bricks or stone or concrete blocks. Nearly 50 cm above the adjoining ground level. The difference: of levels between the top of the pegs and the wall is noted by a dumpy level. Now gently place the loads on the top of the wall by constructing a wooden platform. The load may consist of sand bags, girders or R.S.J. The loads are increased by a suitable amount. usually 0’5 tonne at an interval of 20 to 30 minutes. Before each in­crement of load the difference of levels between the pegs and the,-top of the wall is noted. Note that the difference of level will! remain constant till the soil yields. The moment the difference is increased, the increment of load must be stopped. 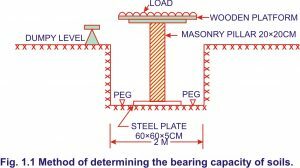 The bearing capacity of the soil will be the total load divided by the area of steel plate. The safe load to be taken on a soil’ for the purpose of design is called Safe Bearing Capacity of the soil. The Safe Bearing Capacity of a soil may be defined as the bearing capacity of a soil divided by a number usually by constant and called factors of safety, i.e. and its factors of safety is 3 the working or design loads to be given to that soil will be 6/3 = 2 tonnes/m2. This is the safe bearing capa­city of the soil.